The ever-growing Google Earth community has been busy scouring North Korea for glimpses at military installations. And according to a recent posting on Radio Open Source, Globalsecurity.org maps have been grafted onto Google Earth, resulting in a fairly comprehensive listing of North Korean military sites that can be viewed using the Google app. 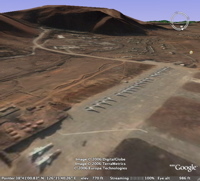 The imaage at the far left, for example, is an aerial view of the sub base at Pipa Got. The image on the right is an unidentified North Korean air base. 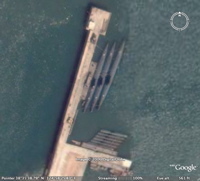 If you have already downloaded Google Earth, you can download the keyhole files for other DPRK installations, such as the Musudan-ri/No Dong missile test range, and the Cho Do naval base.